Disclaimer: In the Future of Paintball series, we at Grey Ops take a look at a promising new trend or technology that may affect Paintball in the near or distant future. As Futurism is a difficult science, and we don't in any way consider ourselves "Paintball Futurists", this recurring feature is for entertainment purposes only. They're ubiquitous in videogames these days, those very helpful arrows always pointing you towards your next objective. Whether you're disarming a bomb, capturing a flag or protecting a VIP, modern day games save you the frustration of getting lost. In paintball scenarios, things are rarely that convenient. In the heat of ropes of paint being flung, sometimes on a field that you don't know, it's possible to lose track of exact objective locations or important waypoints. With GPS technology on the up and up, and prices falling rapidly, it won't be long before this situation will be rectified with affordable and convenient gadgetry. Bushnell already offers a line of pocket GPS devices that are capable of storing multiple locations simply by standing in one spot and setting a waypoint with a single button push. Once a waypoint has been set, the "Backtrack" will point to the set co-ordinates from whatever location you currently occupy, with a distance to the point being displayed as well. 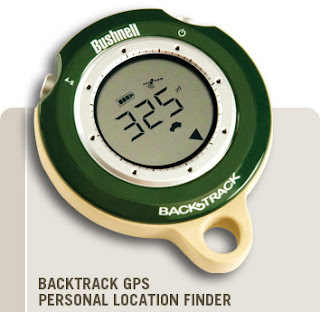 Other advanced versions of the Backtrack allow you to set multiple waypoints, and check temperature, altitude, a digital compass and other features. All of these devices fit in the palm of your hand, and range from $70-90 USD (significantly less from dealers). It sounds like I'm trying to hock the product, but really I'm trying to illustrate a trend towards affordable GPS enabled devices that anyone enjoying the outdoors can afford.